Kilchberg, July 22, 2016 – Despite a challenging environment, Lindt & Sprüngli achieved solid sales growth of +6.6%, with sales of CHF 1.502 billion in the first half of 2016. The biggest challenges facing the company in the first six months of the year were continuously high raw material prices for cocoa beans and cocoa butter, stagnating chocolate markets and generally subdued consumer sentiment. Extensive adjustments of Russell Stover’s product portfolio, as well as the optimization of its promotions strategy also had an impact on Group sales growth in the first half of 2016. On top of that, the performance in the first half of this year is set against the above-average half-year results achieved in 2015. In this difficult environment, Lindt & Sprüngli once again succeeded in outperforming the chocolate market as a whole and gaining important market shares in the first half of 2016. The currency situation has improved slightly during the first six months of the current financial year. In particular, both the euro and the US dollar have strengthened a little compared to the previous year. As a result, for the first time in a while, sales growth in Swiss francs of +6.6% was higher than the increase in local currencies, which was for the Group +4.4%. Excluding Russell Stover and the effects of the ongoing portfolio adjustments, Lindt & Sprüngli achieved organic growth of +6.6%. This represents an acceleration in growth compared to the second half of 2015. The key markets for chocolate, Switzerland and Europe, are largely saturated. In Switzerland, the home market is additionally suffering from the continuing trend for Swiss consumers to shop in neighboring Europe and from increasing pressure from hard discounters on the company’s trade partners. Nevertheless, Lindt & Sprüngli holds on to its well-proven selective distribution strategy and achieved slight growth thanks to targeted marketing activities and excellent relations with the trade. In Europe, the German and French subsidiaries reported very good results. Particularly worth mentioning is the impressive double-digit growth that was achieved by the UK subsidiary. Smaller European subsidiaries such as the Nordics, Russia, the Czech Republic and Poland were also able to report excellent double-digit growth. Overall, the organic growth achieved in Lindt & Sprüngli’s “Europe” region was therefore above-average, with an increase of +5.7% to CHF 738.5 million. Overall development in North America, the world’s biggest chocolate market, was weak, with a decline in sales and volume. However, the premium chocolate segment continues to outperform the chocolate market as a whole. Lindt & Sprüngli is extremely well positioned in this premium segment with its three brands Lindt, Ghirardelli, and Russell Stover and holds the number 1 market position. Following in-depth analysis of Russell Stover’s product portfolio containing more than 2000 articles in total, Lindt & Sprüngli decided to reduce the portfolio aimed at creating important long-term benefits for the business. Strategically not fitting products are currently being eliminated, prices are being increased and terms and conditions adjusted. This portfolio adjustment will impact growth in the short run, but at the same time, sets a healthy foundation for profitable growth in the future. The first newly developed products have already been introduced to the trade and are proving to be promising. Given the described circumstances, the “NAFTA” region reported modest organic growth of +0.8%, with sales of CHF 569.1 million. Excluding Russell Stover, the NAFTA region achieved sales growth of +6.6%. Activities in the “Rest of the World” segment are bearing fruit. Overall, this segment achieved organic sales growth of +10.2% with sales of CHF 193.9 million and is therefore making an increasingly important contribution to Group sales. In particular, this is due to the excellent results achieved by Australia, South Africa, Brazil, and Japan, all of which reported double-digit growth. Lindt & Sprüngli’s selective expansion strategy is therefore paying off over the long term. Global Retail is also continuing its success story. It is key to the company’s vision of becoming the world’s leading retailer of premium chocolate. The global retail network was extended further during the first six months of 2016. A total of 65 new store openings are planned for the 2016 financial year which will result in a network close to 400 stores. Switzerland’s biggest Lindt Chocolate Shop was opened in February at the headquarters in Kilchberg. Here clients can enjoy a huge product selection spread out over 400 square meters of retail space, as well as many attractions to appeal to all chocolate fans from Switzerland and abroad. To summarize, the Lindt & Sprüngli Group once again made good progress during the first half of the year. Operating profit (EBIT) at the end of June 2016 was at CHF 98.4 million (H1 2015: CHF 90.6 million) +8.6% higher compared to the same period in 2015. The Group’s net income came to CHF 72.2 million (H1 2015: CHF 65.0 million), an increase of +11.1% compared to the prior-year period. Compared to the 2015 year-end, the balance-sheet total as of June 30, 2016 reduced by around CHF 405 million to CHF 5,855 million. The situation on commodities markets is still tense. Prices for cocoa and cocoa butter have continued to rise due to poor main and interim crop yields in West Africa caused by bad weather conditions. This was offset to some extent by lower raw-material prices for hazelnuts and almonds. Lindt & Sprüngli is countering these negative effects with internal programs to boost efficiency and save costs. In the area of sustainability, Lindt & Sprüngli can report good progress in the expansion of the Lindt & Sprüngli Farming Program in Ecuador. By 2020, more than 6000 farmers should be able to benefit from the program in Ecuador. The main focus of the program is to support farmers in adopting more professional cocoa-growing methods and to promote the cultivation of premium bean varieties. This helps to increase both the productivity and the income of local farmers. Another priority of the program is to preserve local biodiversity. To remain the world’s leading producer of premium chocolate, Lindt & Sprüngli is continuously investing in new locations and cutting-edge technology. In Stratham (USA), for example, a large production line has just been built to make filled chocolate products as well as a new state-of-the-art Lindor machine installed. In Switzerland, a new production line has been set up for producing chocolate mass. During the current financial year 2016, Lindt & Sprüngli is making total investments of around CHF 250 million. Outlook – Lindt & Sprüngli expects an acceleration of sales growth in the second half of 2016 compared to the first six months of the year. This should enable the company to achieve its strategic targets for the full year. When interpreting the first half-year results, it must be borne in mind that the Lindt & Sprüngli Group is active in the seasonal, gift-oriented premium-chocolate segment, where less than 40% of total annual sales are achieved in the first half of the year. However, these figures must be set against the fact that about one half of the fixed production, administration and marketing costs have already been booked at the end of June. Thus, in the first half-year, profitability in relation to sales is generally well below the figures stated for the year as a whole. 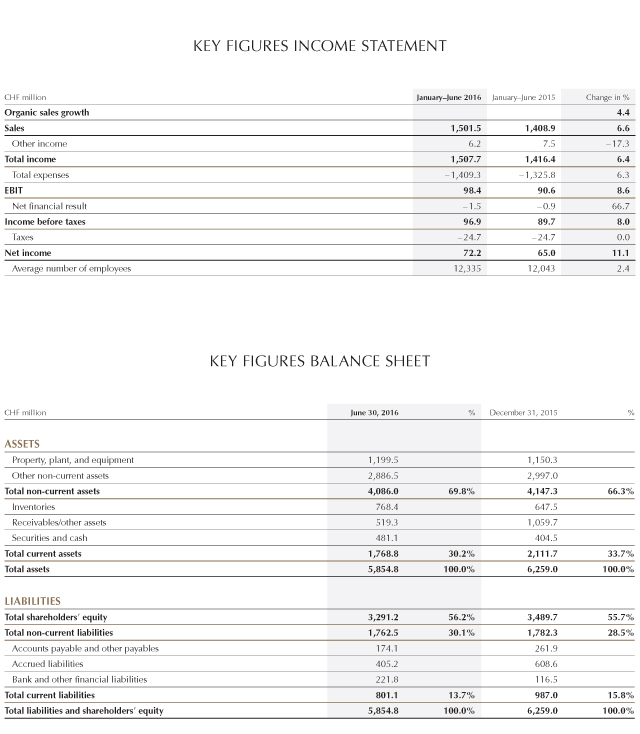 For detailed figures, please visit (Investors – Financial Information).